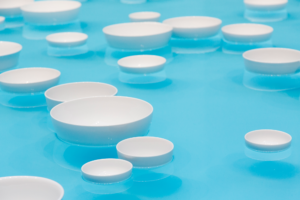 The gentle clinking of porcelain bowls. A melody played by a group of friends. The hidden world of magnetic fields. An absence where tones would ordinarily be. In the background, conversations and footsteps, the hum of an institution at work. 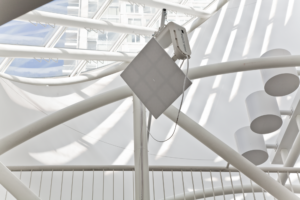 Following the paths that Soundtracks lays throughout the museum, from the seventh to the first floors, visitors encounter these and other sonic experiences. 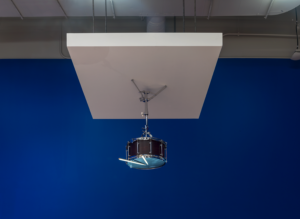 This presentation is SFMOMA’s first large-scale group exhibition centered on the role of sound in contemporary art. 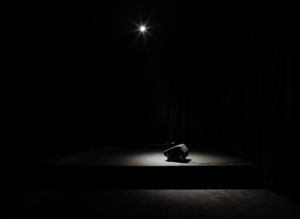 The diverse experiences it offers point to the range of approaches artists have taken to sound as a medium, yet it is not a survey of the genre. 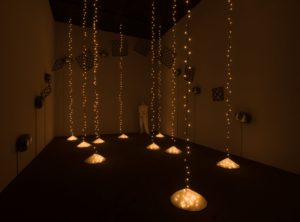 Rather, Soundtracks takes a close look at the relationship between sound and space in various ways, primary among them the relationship between sound-based art and the space of the art exhibition and the museum. By exploring the malleability of museum galleries in response to a temporal element of contemporary art, Soundtrackscontinues the investigations of two previous exhibitions at SFMOMA, The Art of Participation: 1950 to Now in 2008–9 and Stage Presence: Theatricality in Art and Media in 2012, which were organized by Rudolf Frieling and focused on participatory and performative artworks, respectively. 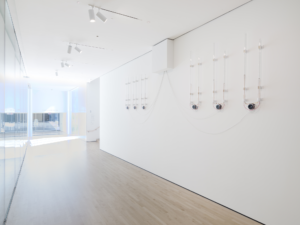 While SFMOMA has a long history of presenting sound-based works, exhibiting multiple pieces in a gallery context has often posed challenges. 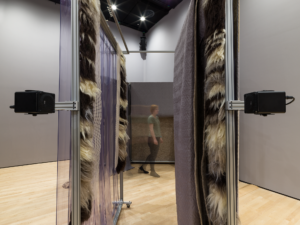 As the exhibition’s co-curators, Rudolf Frieling and Tanya Zimbardo, note in their introductory essay in this publication, “sound cannot be limited by walls and creates overlapping acoustic layers.” Embracing this condition has been central to the conception of this exhibition. The result offers compelling engagements with individual works and an intriguing new way to experience the museum. With a focus on the the spatialization of sound, Soundtracks offers opportunities for discovering public architectural features and galleries throughout the newly expanded building. I applaud Rudolf and Tanya for their pioneering and innovative approach to conceiving this exhibition, and join them in thanking the many dedicated staff members who helped to bring it to fruition. 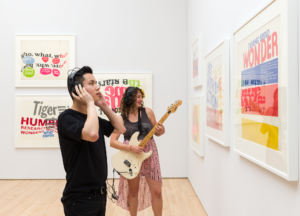 This cross-generational presentation highlights past SFMOMA commissions and new acquisitions on display for the first time, reflecting our commitment to expand the representation of sound-based art in the museum’s media arts collection. We are exceedingly grateful to the artists who have collaborated with us in the past, and to the many artists who worked with us as we prepared this exhibition to make its presentation possible. We offer our deep thanks too to the lenders who generously shared works from their collections for the duration of the exhibition. Finally, we thank the French American Cultural Society and the Office for Contemporary Art Norway for their support. 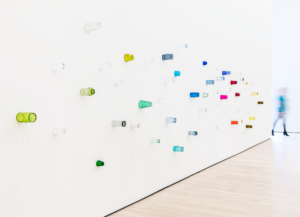 With this exhibition, SFMOMA is expanding its innovative ventures in digital publishing to include an online exhibition catalogue for the first time. 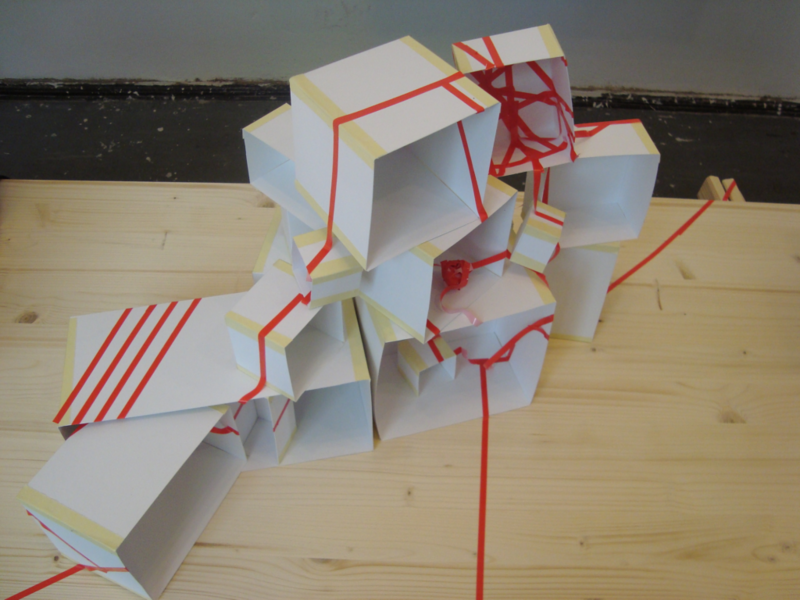 Soundtracks offers an ideal opportunity to explore the possibilities of the digital space for the documentation and interpretation of sound-based work. Accompanying the wealth of insightful writings and still photography is an array of multimedia content, including audio and video documentation of the works presented in our galleries and video interviews with several exhibition artists. 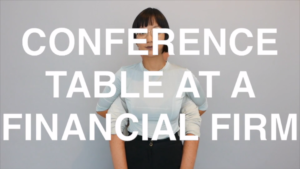 This forward-looking undertaking points to the rich potential of this approach for art with a durational component, a key aspect of much contemporary art. We are pleased beyond measure to offer the results of this endeavor free to audiences around the world. Single-channel video projection, color, with sound, 11 min. LOCATION: PHYLLIS WATTIS THEATER; HOURS: SATURDAY–MONDAY, NOON–3 P.M. LOCATION: FLOOR 5 BRIDGE GALLERY; SOUNDS ON THE HOUR FROM 11 A.M. LOCATION: FLOOR 2 THOMAS WEISEL FAMILY GALLERIES; HOURS: THURSDAY–SUNDAY, NOON–3 P.M.
Two HD videos, color, no audio, 9:15 min. and 10:17 min. Nine-channel HD video projection, color, with sound, 64 min. 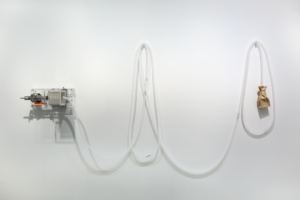 Twelve-channel sound installation, 47 min. Altered snare drum, drumsticks, altered snare stand, loudspeaker parts, and mono sound, 7:18 min. Chairs, transducers, amplifier, media player, and audio composition, 26 min. Dena Beard is executive director of The Lab, San Francisco. Chris Downey is an architect who lives and works without sight in the Bay Area. Rudolf Frieling is curator of media arts at SFMOMA and a co-curator of Soundtracks. 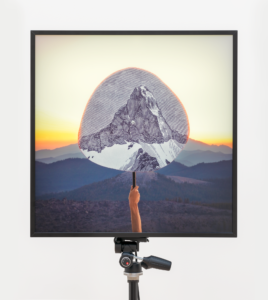 Brandon LaBelle is a Berlin-based artist, writer, and theorist who works with sound, performance, text, and sited constructions. 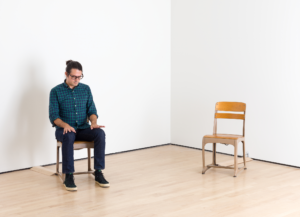 Frank Smigiel is associate curator of performance and film at SFMOMA. Tanya Zimbardo is assistant curator of media arts at SFMOMA and a co-curator of Soundtracks. 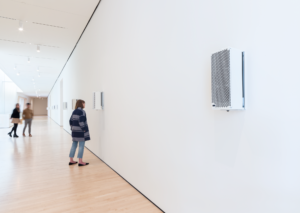 With a focus on acoustic experiences while moving through space, Soundtracks offers opportunities for discovering distinct architectural features throughout SFMOMA’s recently expanded building. 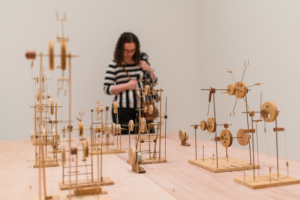 The process of planning Soundtracks, however, began during the museum’s temporary closure to the public for building construction, when we could only imagine our new galleries and how works might sound in them. It took a leap of faith to dedicate the entire seventh floor and select locations throughout the building to this presentation. First and foremost, we must thus express deep gratitude to Neal Benezra, Helen and Charles Schwab Director at SFMOMA, and to Ruth Berson, deputy museum director of curatorial affairs, for embracing the idea behind Soundtracks and suggesting the exhibition’s timing and scale as a way to address our new building. We were fortunate to have the support of our curatorial colleagues to situate contemporary works in various public spaces and new galleries on different floors in proximity to their exhibitions. Realizing a presentation of this scale and complexity would not have been possible without the dedicated vision and collective effort of numerous individuals who collaborated with us throughout this process. We are especially grateful to the artists who conceived, and in some cases adapted, the work presented in Soundtracks. They provided invaluable input, joined by their studio collaborators, including Joseph Digerness, Arup (programming for Bill Fontana), artist Laetitia Sonami (audio contribution for Jacqueline Kiyomi Gordon), Lilja Gunnarsdottir and Christopher W. McDonald (Ragnar Kjartansson studio), Manfred Fox and Eckehard Güther (technical assistance and engineering for Christina Kubisch), Sergio Clavijo and Karine Charbonneau (Rafael Lozano-Hemmer studio), and Eoghan McTigue (Susan Philipsz studio). Additional help was provided locally by Javier Roberto Carlos Briones, 32K Productions (video production for Amor Muñoz), and by the numerous guitarists who are performing in our Floor 2 galleries over the course of the exhibition, including Erin Allen, Allyson Baker, Mike Ballan, John Burke, Giacomo Fiore, Shaina Lerner, Sean Nieves, Ryan Pate, Elsa Trash, and Christine Tupou (custom soundtracks for Chris Kallmyer and Mark Allen). For their generous assistance at every turn, our thanks go to bitforms gallery, New York; Tanya Bonakdar Gallery, New York; Carroll / Fletcher, London; Paula Cooper Gallery, New York; Marc Foxx Gallery, Los Angeles; Marian Goodman Gallery; i8 Gallery, Reykjavík; Luhring Augustine Gallery, New York; MUJIN-TO Production, Tokyo; Overduin & Co., Los Angeles; and Galeria Nara Roesler. 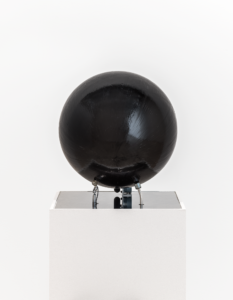 We are also extremely grateful to the lenders to this exhibition: J. K. Brown and Eric Diefenbach, Eduardo F. Costantini, Malin Family, and Gina and Stuart Peterson. Perrin Meyer of Meyer Sound; Stéphane Ré, former cultural attaché of the Consulat Général de France in San Francisco; and Katya García-Antón, director of the Office for Contemporary Art Norway, were instrumental in generously providing much-needed equipment loans or travel grants for individual artists. We were pleased to have the opportunity to collaborate with Frank Smigiel and Christian Davies, our colleagues in Performance and Film, for the live performances presented by Soundtracks artists O Grivo and Camille Norment during the exhibition’s opening weekend, and with Dena Beard, executive director of The Lab, San Francisco, for an additional performance by Norment at The Lab as part of the artist’s residency in the Bay Area, organized by SFMOMA. We thank David Funk, Annie Hagar, and Jessica Woznak, who worked tirelessly to oversee and coordinate the exhibition staff and endless details. Led by installation manager Brandon Larson, the team of Jamie Banes, AJ Bucknall, Brian Caraway, Sonya Castillo, Bobby English, John Holland, Melody Kennedy, Jess Kreglow, Ryan Onstine, Stephanie Sherriff, Ian Treasure, and Greg Wilson, with the on-call crew of Eli Forbyn, Bink Galbraith, Colin King-Bailey, and Muzae Sesay, executed an ambitious installation with expertise, together with exhibition design manager Kent Roberts and Sarah Choi. The myriad technical details entailed by an exhibition centered on time-based media in various formats were adeptly handled by exhibitions technical manager Steve Dye and his team members Joshua Churchill, John Davis, Sasha Dobbs, Derek Gedalecia, Sean Horchy, Collin McKelvey, and Jesse Walton. Grace Weiss ensured the smooth transport of artworks from around the world and facilitated their presentation in the galleries with the help of Arran Harvey. Martina Haidvogl, joined by her Conservation colleagues Michelle Barger, Emily Hamilton, Amanda Hunter Johnson, and Roberta Piantavigna, provided attentive care to the works on view. This exhibition marked an opportunity to showcase a number of new additions to the collection, accessions activity all graciously overseen by Maria Naula. Christopher Lentz and the Visitor Experience staff, including Katherine Wallace, Kelly Bishop, Ginger Davis, and Nicole Meshack, are skillfully managing the daily challenges of bringing performative and participatory artworks to our public, in close collaboration with Media Arts administrative assistant Stephanie Guasp, who not only coordinated all travel but is also managing the schedules of screenings of Guy Ben Ner’s Soundtrack and the many performers for Chris Kallmyer and Mark Allen’s Live Personal Soundtrack. We thank Jeffrey Alexander for overseeing the projectionist schedule in our Phyllis Wattis Theater. Curatorial interns Enar de Dios Rodríguez, Ziying Duan, and Ana Fox-Hodess helped us with preliminary research assistance. We are grateful to our colleagues in Marketing and Communications for their efforts on behalf of the exhibition, in particular Katie Booth, Antonio Campos, Dan Conway, Emma LeHocky, Magnolia Molcan, Christine Laquer Pacheco, Lindsay Saito, Tracy Wada, and Marina Weiner. In Development, Christine Mettel, Amanda Spector, and Lanlian Szeto were instrumental in organizing the joint Summer Bash exhibition reception. 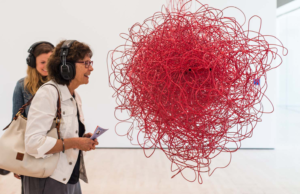 Amy Deverell, Suzanne Field, Julie Knight, and Ric Weaver welcomed SFMOMA members through special preview days. Staff members in the museum’s Content Strategy and Digital Engagement division lent their talents to both the exhibition and this publication. To the museum’s Publications and Web and Digital teams, led by Kari Dahlgren and Keir Winesmith, thank you for welcoming the challenge of creating the museum’s first solely online exhibition catalogue with enthusiasm and for exploring the possibilities it affords to include documentation and dynamic multimedia content during the run of the show. It was an extreme pleasure to work with Jennifer Knox White, the editor of this catalogue and exhibition materials, who moved the entire publishing process graciously yet firmly forward with great attention to detail. Sarah Bailey Hogarty lent her expertise to overseeing its design, development, and content production, and worked tirelessly to coordinate videography and build these pages. James Provenza conceived the beautiful exhibition identity and brought his keen design eye to bear on the printed guide, exhibition signage, and this publication. Carrie Taffel coordinated many design-related details. Brianna Nelson edited texts and signage with great thought and care. Bridget Carberry was crucial to developing the framework for this online exhibition catalogue, and Emily Robbins and Ana Fox-Hodess played a key role in documenting the works on view. Erica Gangsei and Erin Fleming, with 32K Productions, created the insightful new video interviews that appear in these pages. We also thank Katherine Du Tiel and Mary Ellen Hawkins, with Don Ross, for capturing beautiful photography of the works on view in our galleries. Sriba Kwadjovie kindly assisted with image permissions. The 360° installation videos were produced by the Adobe Design team. Finally, this publication has been enriched enormously by the guest contributions of Brandon LaBelle, Dena Beard, and Frank Smigiel. We are grateful for their rich insights into the relationships between sound and space, and to Chris Downey for allowing us to republish his thoughtful reflections on Bill Fontana’s Sonic Shadows. 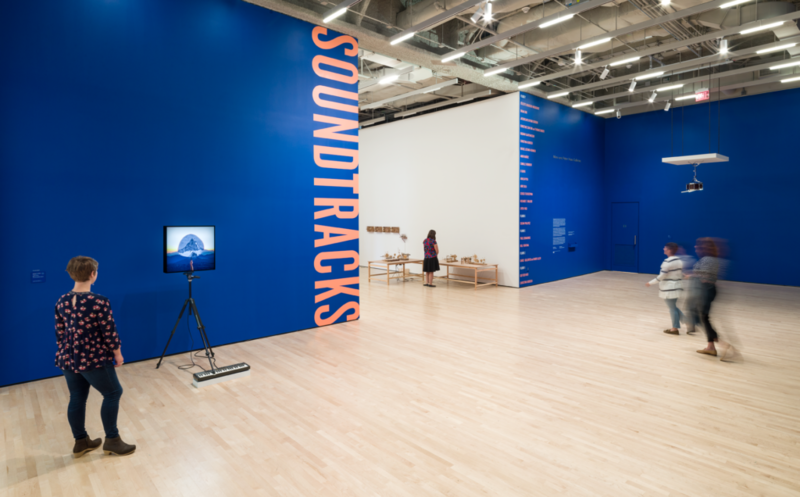 This digital catalogue is published by the San Francisco Museum of Modern Art on the occasion of the exhibition Soundtracks, co-curated by Rudolf Frieling and Tanya Zimbardo, held at the San Francisco Museum of Modern Art from July 15, 2017, to January 1, 2018. Support for Soundtracks is provided by the French American Cultural Society and the Office for Contemporary Art Norway. Copyright © 2017 by the San Francisco Museum of Modern Art, 151 Third Street, San Francisco, California, 94103. All rights reserved. This digital publication may not be reproduced, in whole or in part, including illustrations, in any form (beyond that copying permitted by Sections 107 and 108 of the U.S. Copyright Law and except by reviewers for the public press), without written permission from the publishers. Texts by Brandon LaBelle and Room Tone participants from Room Tone © 2015 Brandon LaBelle. Reprinted by permission of the author. 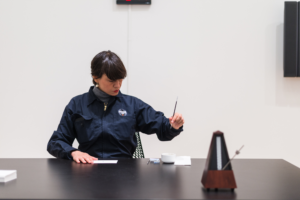 “Conversation: On Performing Live Personal Soundtrack” © Machine Project. Reprinted by permission.